Publisher: People's Publishing House (P) Ltd. The Title "Gandhiji A Study 5th Reprint" is written by Hiren Mukerjee. This book was published in the year 2010. This book also comes in Hardback . The book displayed here is a 5th Reprint edition. This book has total of pp. xviii + 225 (Pages). The publisher of this title is People's Publishing House (P) Ltd.. We have about 423 other great books from this publisher. 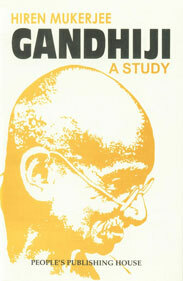 Gandhiji A Study 5th Reprint is currently Available with us.